I waited for what felt like an eternity to use up all of my other shampoo that I had stocked up on before buying some more Daddy-O. Reason being, it is rather expensive for how much you get so in a way I was avoiding it for as long as possible. I stocked up on shampoo and conditioner when I quit my job to save having to put those items on top of our shopping bill...the thought of adding 'unnecessary' costs to the food shop made me raid Superdrug's special offers and stock up on other brands with one of my last pay cheques and the downside to this is, my hair suffered. I'm not a snob by any means, but I noticed for sure my hair didn't like using certain brands yet my determination was still there; to use them all up and start to buy from Lush again to reduce plastic and also, give my hair the nourishment it deserves. Sure, Lush still use plastic to package some of their products but the silver lining is you can return these containers for them to recycle and better yet, for every 5 you return you get a free fresh face mask. My hair has never felt better after using the Daddy-O shampoo so in all honesty I don't mind paying the price, I just make sure I make it go as far as possible. Now I don't work with animals, I can get away with only washing my hair once a week which is an absolute dream because my hair really does feel better for it and I'm lucky enough to be able to go so long without having to use so much as a dry shampoo. Those days are long behind! A few weeks back I was in Birmingham to see Our Last Night live and beforehand, I nipped into Lush with my friend Vikky to seek out a shampoo and conditioner for her. Since she's a nut allergy sufferer, she can really struggle to find a brand that is safe and for months I'd urged her to get into Lush and see what they could offer. They were kind enough to spend a decent amount of time finding something for her to try and also provided her with some samples to take away and see how she'd get on, to save spending a fair bit on products just in case her allergies flared up and so far so good. No bad reports yet! Whilst in there, I couldn't help but spot the Sugar Daddy conditioner bar and I don't remember seeing it before so perhaps it's fairly new. I refrained from buying one there and then, knowing full well I still had conditioner at home to use up but I kept it on my wish list. Then on my birthday a couple of weeks later, I popped into Lush in Leicester to treat myself with some birthday money. 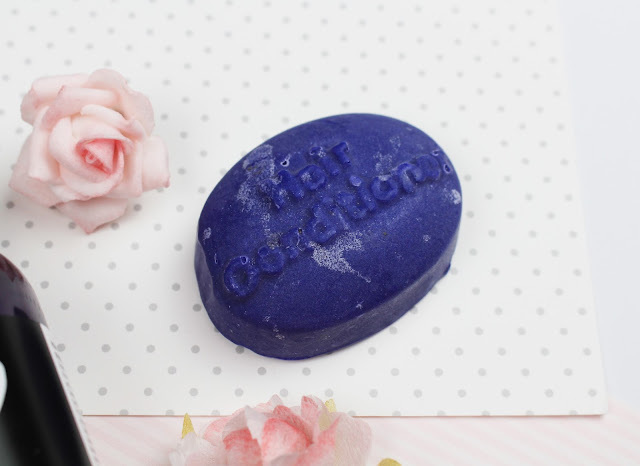 By this point I had used up near enough every last drop of the other products I had at home so I didn't feel any guilt whatsoever in buying new stuff and better yet, the conditioner bar has no packaging except a tiny sheet of paper that I'll be recycling into my art journal. Win win! I couldn't wait to test out my new conditioner bar so the next day I was in the shower with it and to begin with I was a little skeptical. I had washed my hair with the Daddy-O shampoo beforehand and then tried lathering up the conditioner bar between my hands to apply to my hair. Not very much was happening, so much so that I had to get out of the shower, grab my phone and quickly Google how to use their conditioner bars, convinced I was doing something wrong. Nope, I was doing everything right so I did a crazy gibbon run back to the shower and tried again. Still not much was happening but I put the bar between my hair and palm of my hand and ran it down the ends of my hair a few times before deciding I'd tried enough and that I'd just have to wait and see what it felt like when it was dried. I wasn't especially happy about this since my hair is disgustingly dry if I don't condition it so I wasn't looking forward to it at all. I brushed my hair with a comb, plaited it damp and went to bed. The next morning I was dying to give my hair a good feel and I was amazed at how soft it was. I honestly expected a really straw like feel to it but it was silky and smelt divine. Turns out the conditioner bar must have worked, it just doesn't feel like you're getting much product when lathering it up. The good side to this is I used barely any of the product so I'm hoping it lasts me quite a while and I'm super excited to use it again. One of my favourite things about the two products is the smell and how long it lasts. When I use any other shampoo, I can't really smell it on my own hair even straight after the shower but Daddy-O I can still detect three days later and every time you move your head, you get a lovely whiff of Parma Violets. What's not to love? Plus these two gems happen to be part of Lush's vegan range and of course, they're cruelty free.